Vicky Vargo of Cleveland reacts after winning a Honda Civic during the Donate to Win program at Nassief Honda on Saturday morning in Austinburg Township. 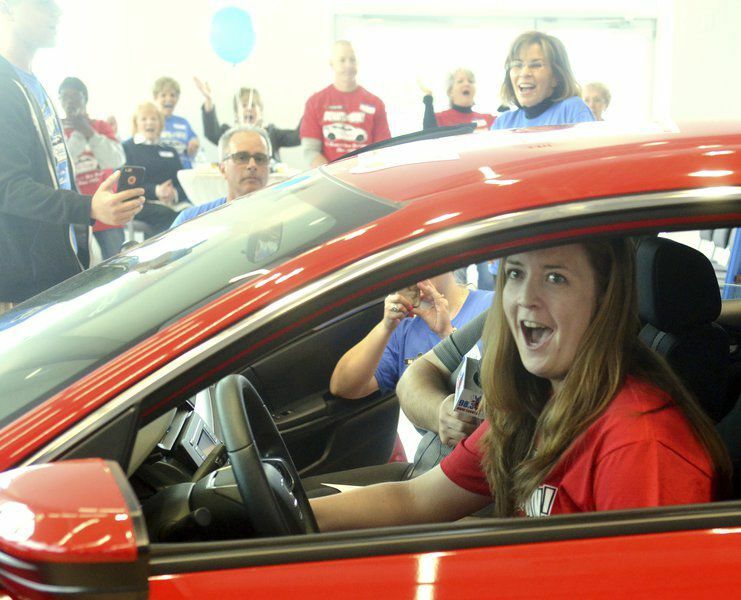 Vicky Vargo, of Cleveland, reacts after winning a Honda Civic during the Donate to Win program at Nassief Honda on Saturday morning in Austinburg Township. Vicky Vargo reacts after winning a Honda Civic during the Donate to Win program at Nassief Honda on Saturday morning in Austinburg Township. Karen Mathias leaves a Honda Civic after her key did not start the ar during the Donate to Win program at Nassief Honda on Saturday morning in Austinburg Township. The finalists of the Donate to Win program at Nassief Honda on Saturday morning in Austinburg Township include (from left seated) Karen Mathis, Dan Tisdale, Pauline Lentz, Don Camp, Julie Bowes, Kim Ellis, Jamey Shahan, Linda Spellman and (from left standing), Mary Valitsky, Sonja Sorenson, JoAnn Herendeen, Vicky Vargo, Beverly Stasko (representing David Gill), Babs Legeza (representing Joel Specht), Keith White, Reba Sykes and Cheryle McCourt. Dan Tisdale of Jefferson was unable to start a Honda Civic during the Donate to Win program at Nassief Honda on Saturday morning in Austinburg Township. AUSTINBURG TOWNSHIP - Four months of giving concluded on Saturday afternoon with a Cleveland area woman winning a brand new Honda Civic at the conclusion of the Nassief Auto Family Donate to Win event. Vicky Vargo, of Cleveland, was the 12th person to turn a key in the ignition of the new car when the noise of an engine starting permeated the new dealership. An excited Vargo said she donated about 12 bags to Goodwill and bought a pair of sweat pants never thinking she might win, Vargo said. "I've never done anything like this before," she said while trying to compose herself. Vargo said she wore the sweat pants for good luck. Vargo said she believes she will keep the Honda Civic, but said she hadn't thought much about it because she didn't think she would win. "It's a nice car," she said of the vehicle equipped with an automatic transmission, backup camera, Bluetooth, a five color LCD screen, security system and more. Vargo hugged a friend and joked with her family after the car turned over. She was not the only winner of the day as three local non-profit organizations have been receiving the bounty of the program for five years. soup kitchens and shelters in Ashtabula County. Goodwill Executive Director Eric Schwarz said the donations help provide funds to keep people working through the winter. "We convert the donations into funds to pay for programs," Schwarz said of the program that helps people with "employment barriers" enter the workforce. Each bag donated to the three organizations was translated into one ticket for a drawing that was held recently to cut the field down to 18 finalists. The finalists all were placed into a numerical order to pick their keys from a board by the time they arrived on site.